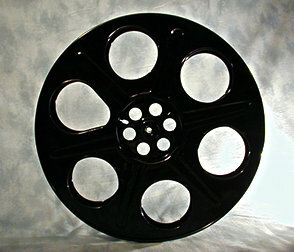 This durable heavy weight metal film reel is fantastic! It's a real "reel" and perfect for any room or as a unique gift idea. Measures approximately 14-1/2" in diameter x 1-1/2" thick. Powder coated in black. Made in U.S.A.